Are you wondering how to decorate a console table but don’t know where to start? 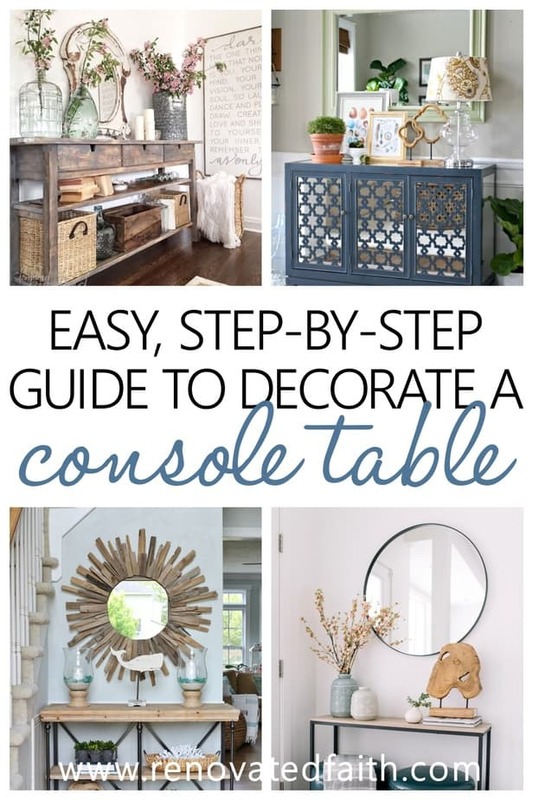 This step-by-step guide will give you lots of entry table ideas for any home, style or season! The main function of an entry table is for display purposes as they are often times in prominent spaces in your home. And the accessories on an entry table and how they relate to each other is called a “vignette”. But this guide is for people, like myself, that don’t use the term “vignette” in everyday life and just want a cute arrangement of accessories that make sense together on their entry table. Your home’s décor is for no one else but YOU. It should bring a smile to your face, uplift you and even remind you of what is most important to you. However, decorating a console or entry table can be a daunting task if you don’t know some basic steps to help you create a display that you’ll love to come home to daily! 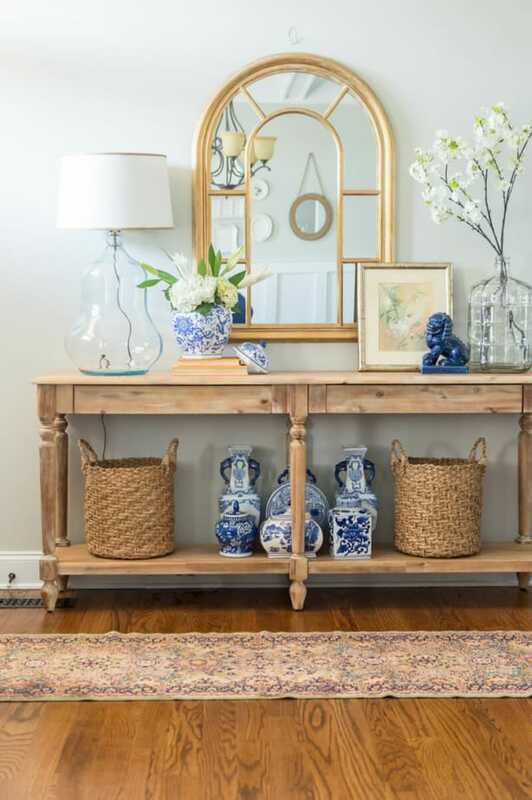 What’s the Difference Between a Console Table and Entry Table? If you are wondering the difference between a console, entry table and sofa table, there’s no real difference in that they are all just display tables and the same guidelines apply for each. The only distinction is that a sofa table is usually behind a sofa, an entry table is often in an entry and a console technically is a table against a wall. But for the purpose of this post, I’ll use those terms interchangeably. DISCLAIMER: There is one major rule for decorating an entry table and it actually applies for all home decorating in general. Whatever decor or style you like trumps any decor advice anyone gives you. In other words, these “rules” below are just guidelines to help. 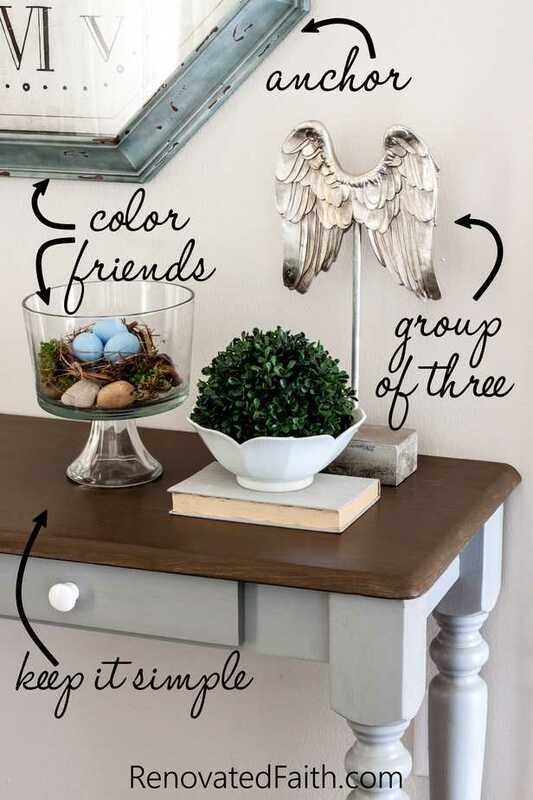 For every one of these rules, you can probably find a gorgeous entry table display on Pinterest that breaks that rule. You have the final say on what looks best and these guidelines are here to help you get started. It’s YOUR HOME so embrace what YOU like. Also, it’s important to note that a console table can any sort of display table like a buffet or even a cute dresser. I’ve even seen sewing tables and pianos function really well as entry tables. 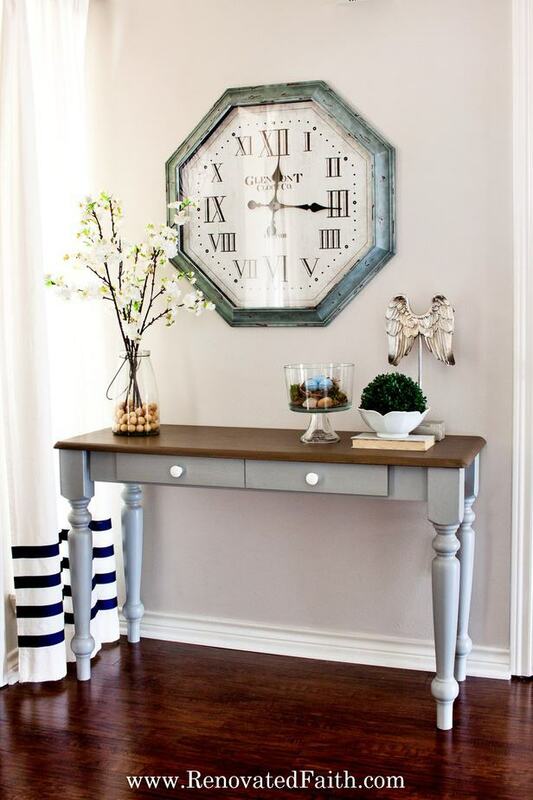 Every entry table should have a piece of art, mirror or even an old window above it as the focal point or anchor. Think of your anchor piece as the framing of a house that everything else relates to. The width of your focal point should always be less than the width of your table. 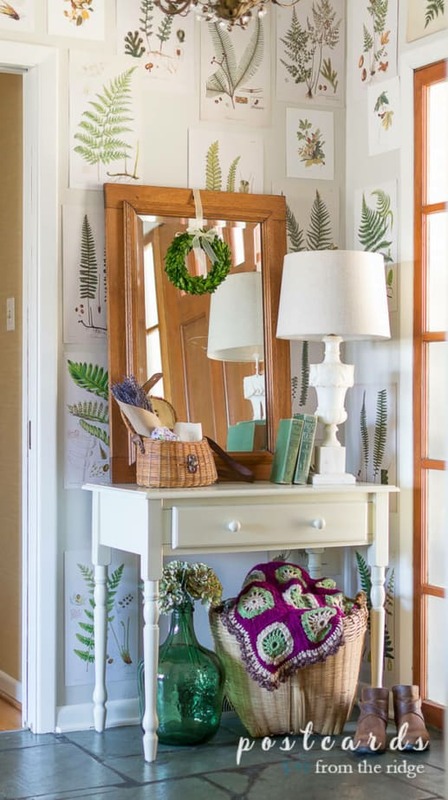 Mirrors are always really easy to work with because they make the room look larger and you don’t have colors to coordinate with such as you would with a piece of art. Also, they provide a crisp, clean look for any decor. One classic way to style any display table is with symmetrical décor. 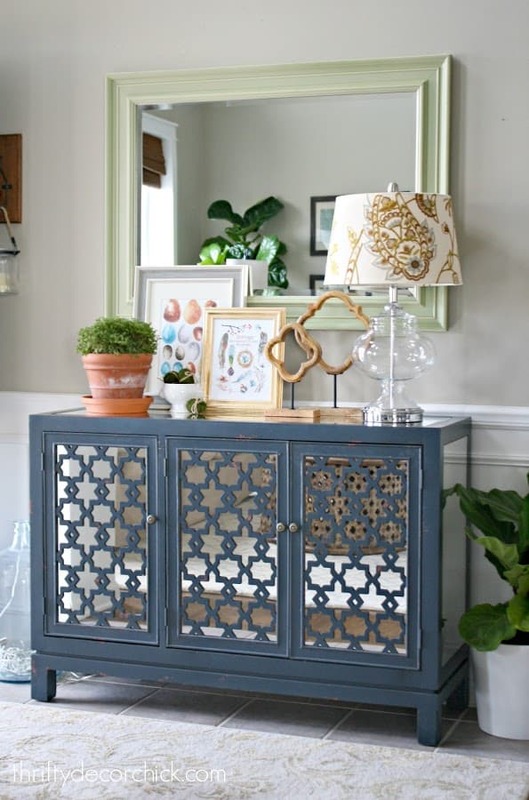 Carrie from Lovely Etc has an excellent example of this with her vintage metal entry table. Notice how she has flowers on both sides to create a symmetrical look. Often with a symmetrical layout you will have the same or a similar tall object on either side with a filler items in the middle. You can use vases of flowers, lanterns or lamps as your two tall items. Also, I love how the flowers on each side are not exactly identical. This makes the entry décor a little more interesting and frees you up to find similar items you already have around the house. Notice how she uses the books as filler to fill in the negative space under the mirror. You can also use several short votive candles, or a long flower box with hydrangeas as filler. The other option is to have asymmetrical décor. What works well is it have one side with accessories that are tall and skinny and the other side with accessories that are short and wide, which creates a real sense of balance to your accessories. Notice how the accessories on my faux stained entry table follow this rule with the skinny and tall vase of flowers on one side and the shorter, wider accessories on the other. Often groupings of accessories look best in odd numbers. You’ll notice how Emily at Small Stuff Counts does an amazing job of decorating with clusters of three. Also, I love how nicely the accessories fill the negative space around the round mirror. Notice how she keeps the bottom shelf simple too but that doesn’t mean it lacks storage options, as you can see from the basket and white box. Everybody needs a friend and the same applies in decorating! To help the accessories in your entry display to tie together, make sure each item has a ‘color friend’ so there are always at least two objects of each main color. Notice how Angie of Postcards From the Ridge applies this concept making sure that each item has at least one other item of the same color to tie the whole display together. The green in the boxwood wreath ties in with the vase and the purple of the lavender ties in nicely with the throw. The most appealing console table displays are the ones that are not overcrowded with accessories. This is one of those instances that less is actually more. One hint to make your decor look less cluttered is to only decorate with items larger than a cantaloupe. This is not a hard and fast rule but it’s a good guide to make sure things don’t look too crowded. It’s good to air on the side of things being a little sparse. 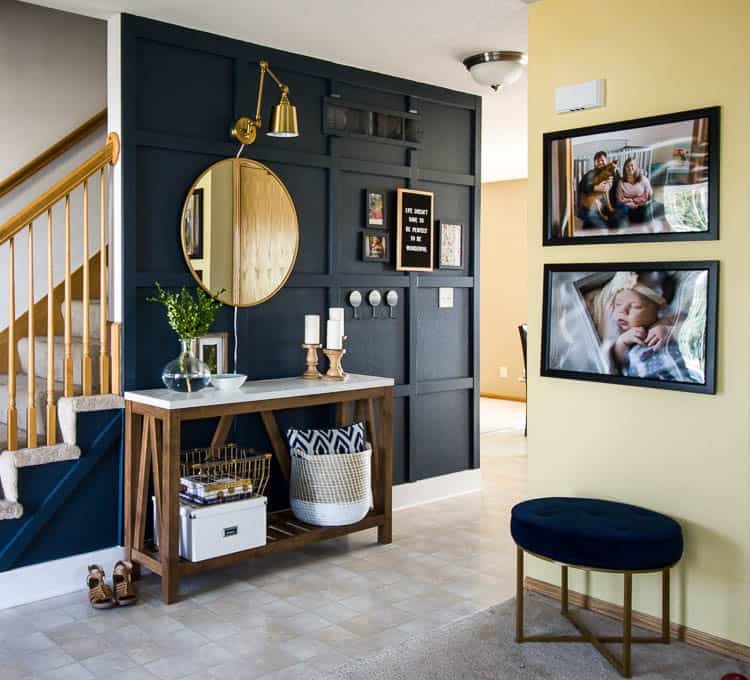 See how Diana of 204 Park creates plenty of interest with only a few accessories and does a fabulous job applying the “less is more” approach. She puts enough to fill the negative space on both sides but keeps her entry decor simple. I love the ottomans underneath that are not only stunning but is a great storage idea for extra seating. Now that you have some ideas on how to get started, here are some ideas on which accessories to choose. Here are some beautifully decorated entry tables to help you decorate your own! There’s absolutely no shame in copying some of the ideas you see online and adding your own spin. 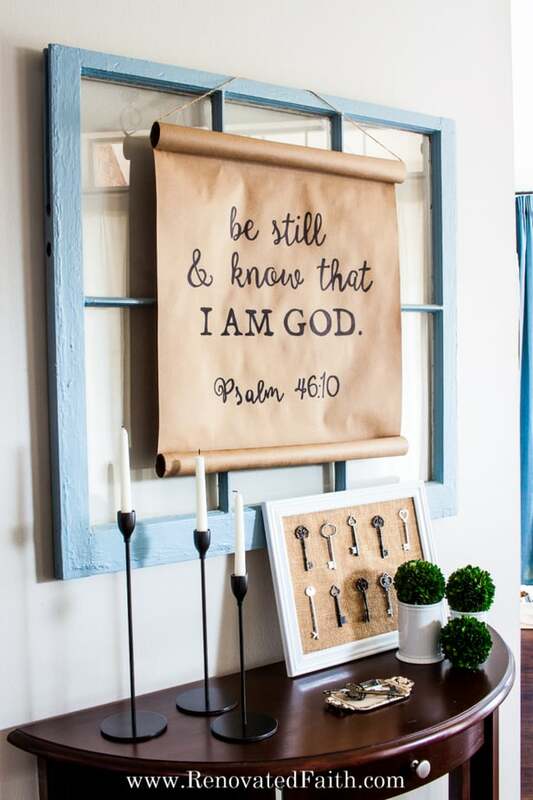 If you’re into Farmhouse décor, check out this Coastal Crafty Mama on Etsy. 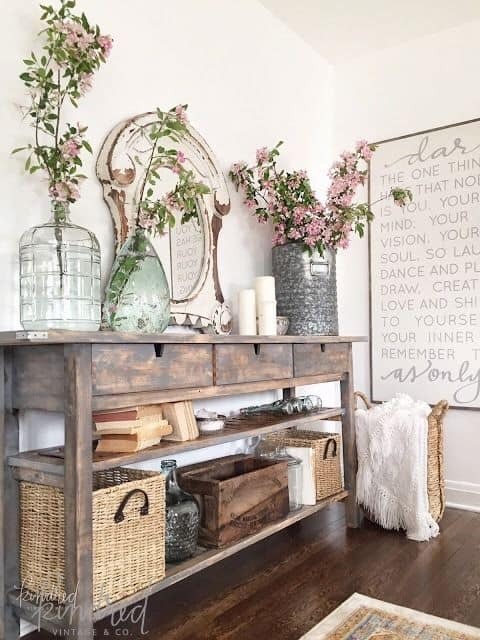 I am in love with this painted sign and how she incorporates farmhouse elements into her entry table decor! I’m personally a huge fan of coastal decor, maybe even more than farmhouse! 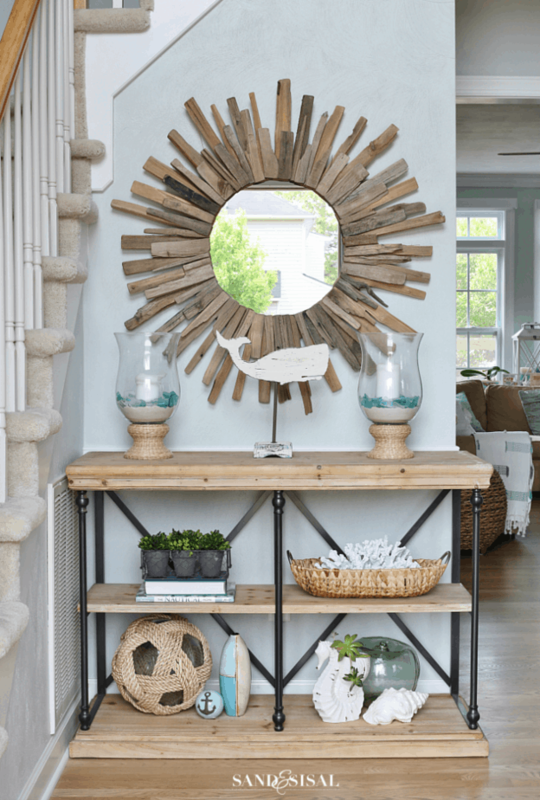 I know…<gasp!> If you are into coastal decor like I am, Kim at Sand and Sisal has tons of cute ideas on how to integrate a beachy, driftwood look into your existing decor. Susan over at Kindred Vintage & Co. outdoes herself with this gorgeous Ikea sidebar makeover, adding lots of blossom stems to a galvanized container and glass vases. 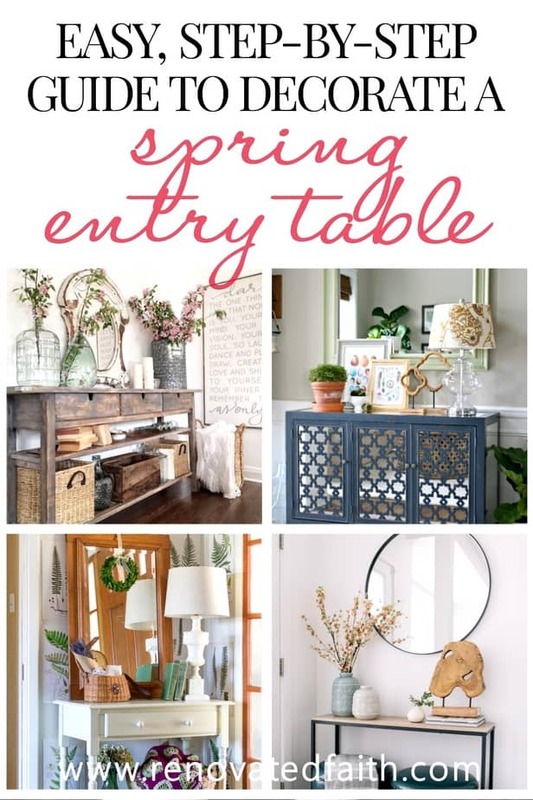 Via Kindred Vintage & Co.
Sarah at Thrifty Decor Chick decorates her entry with Spring decor and this stunning console table! I love how she layers the frames to create more visual interest. Linda from The Home I Create decorates this stunning console table for spring by integrating white flowers with her traditional blue and white accessories. She illustrates that you can create entry decor for a specific season while combining it with classic decor you already have. 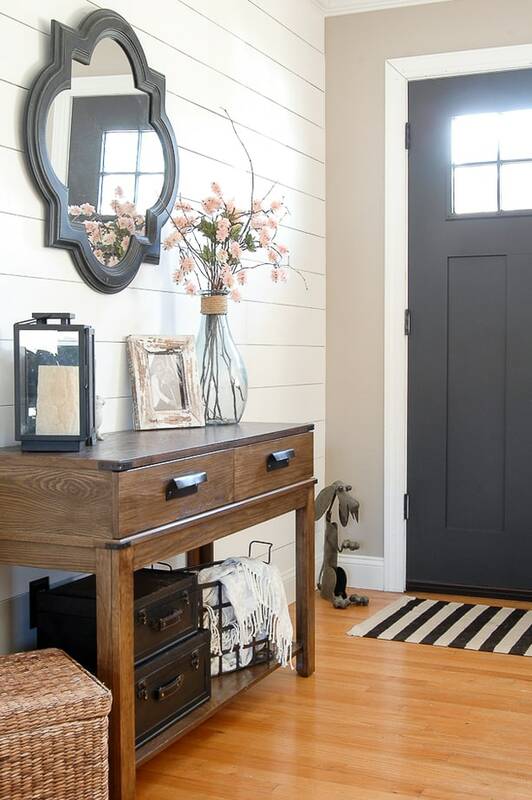 Katie over at Little House of Four does an incredible job with her entryway, making it versatile to decorate for any season. 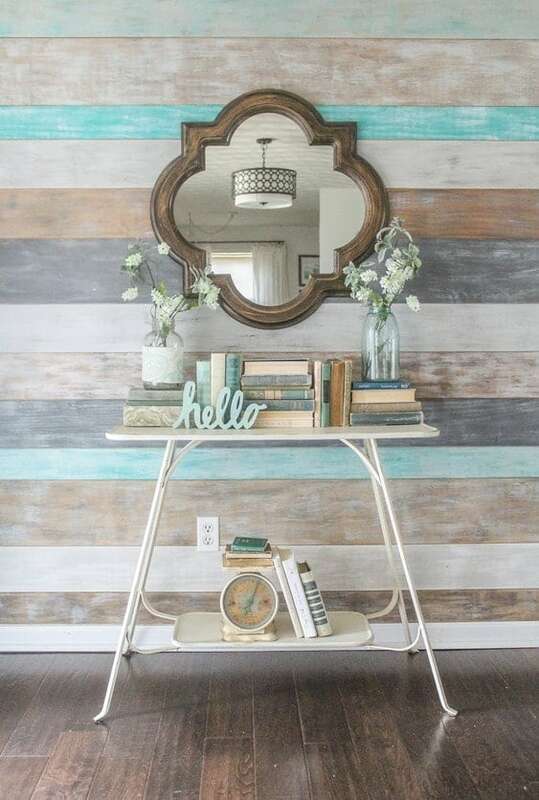 I adore her shiplap wall serves as a beautifully contrasting backdrop for her spring decor. You don’t have to spend a lot to decorate your entry table decor. In the picture above, you can see my half-moon entry table with an old window as my anchor. On it, I put my DIY Scroll Wall Art which cost less than $5. I also spray-painted some old candlesticks, decorated an old frame with spray-painted keys and burlap and added some boxwood balls from Target. For a round, or half-moon entry table, you can use the same guidelines as I explain above. You are just limited on space with the rounded corners so it’s best to keep it simple by only accessorizing with a few items that coordinate with your anchor piece. Many entry tables have a bottom shelf like the pic below. This gives lots of options for decor but also storage. Decorate the lower shelf in the same way you decorated the top of the entry table. Use the same guidelines with having slighly taller/skinnier objects on one side and wider/shorter pieces on the other side. 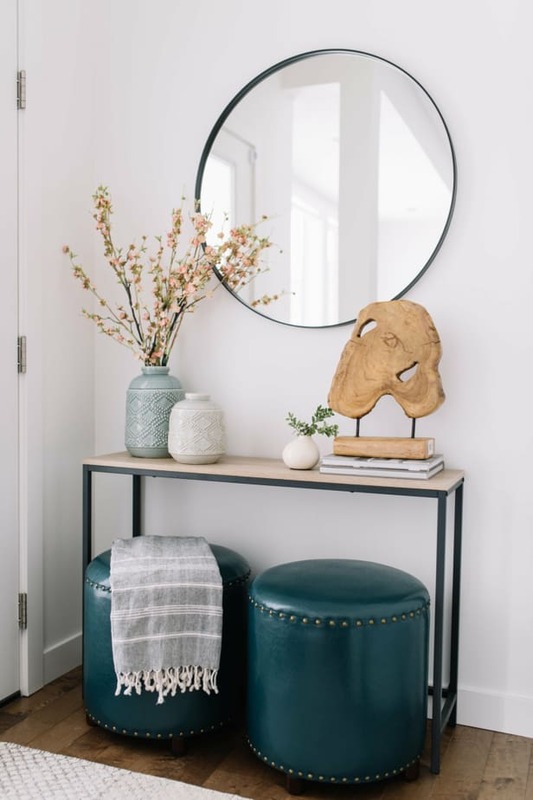 If you use the same concept on the top of the console table, make sure your tall items are not on the same side to make it more interesting. Decorating a console table behind a sofa (or sofa table) is easy. The only main difference is you have no anchor as of course there is no wall to hang a mirror or picture. Often times, it works well to go with symmetrical decor, as we mentioned earlier in the post, since there is no anchor. You can decorate with lamps on each side which provides additional lighting like the image above. When decorating an entry table in front of a window, the window itself serves as an anchor. Make sure your decor coordinates with curtains. This is a great place to have a coffee table with ottomans underneath as there is probably a chair not too far from the window. The ottomans can be easily pulled out as a foot rest. Here’s a more typical decorating scenario for decorating a console table in front of a window. See how the table fills the blank space in front of the window and enhances the view. You don’t want to obstruct the view through the window but add to it. 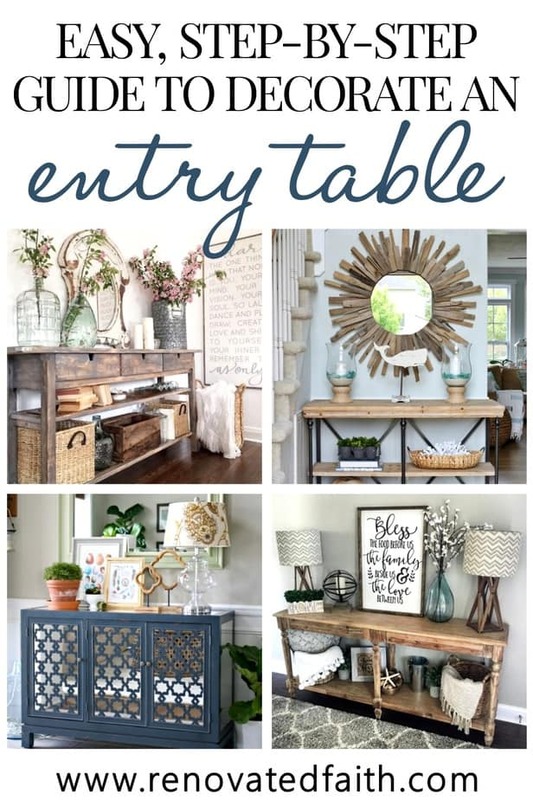 Entry table decor can be a little intimidating because there are so many options for decor. However, it’s easy when you know where to start and have some basic guidelines to help that reflect your own style and tastes. 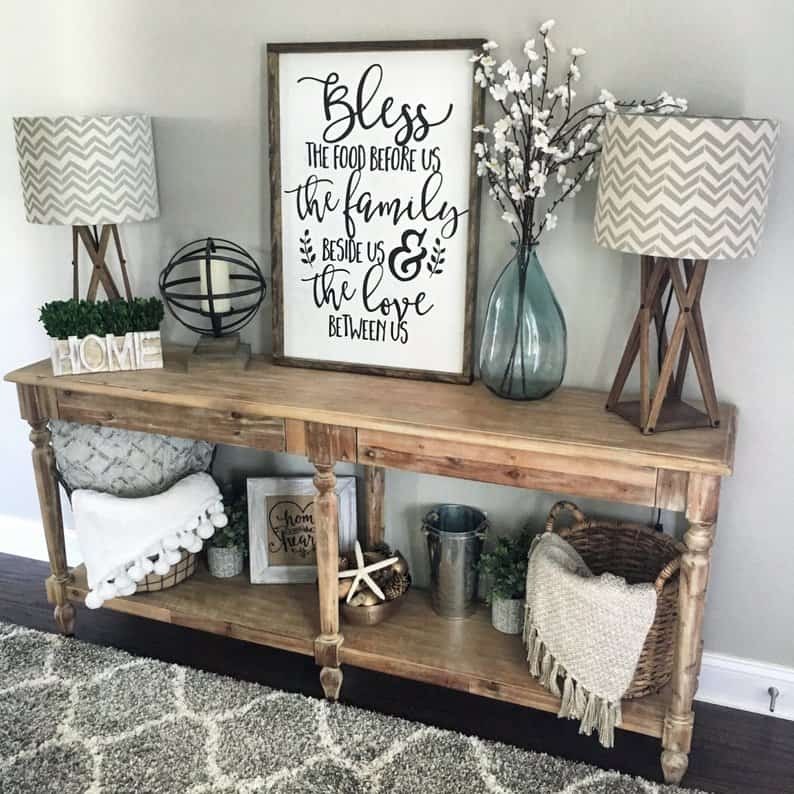 Whether you love farmhouse style, coastal decor or want to decorate your console table for any season, there are plenty of options with the items you already have in your home! I appreciate your detailed directions very much. 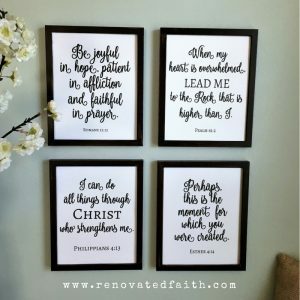 For me, I prefer signs with scripture. My favorite is Jeremiah 29:11. I especially enjoyed seeing you make the scroll in a previous post. I am not talented enough to make signs nor do I have the computer skills. I liked the information about all the tables. You do a beautiful job on your blog. Thank you for all your printables. Hey Nancy! Thank you so much. I so appreciate your encouragement and that is on of my favorite verses too. Thank you for stopping by!